Forty years ago this past April, Martin Luther King, Jr. was assassinated in Memphis. For those who weren抰 around at the time, the country sat on the edge of turmoil in the wake of this senseless murder. There was widespread rioting in most of the major cities in the U.S., houses and businesses were burned and looted, and more deaths ensued. One city that was spared much of the violence or damage was Boston, but it could have easily gone the other way but for a few fortunate events. The most fortuitous was a concert that had been scheduled for Boston Garden on April 5, 1968, the day after King was killed. The main attraction was Soul Brother Number One, James Brown. Though Brown has always been regarded as one of the pioneers of soul and funk music, few realize the impact he had on the black community. A staunch supporter of Civil Rights, Brown stressed self-help within the black community, through education achievement and personal improvement. For Brown, this concept was a no-brainer, for he single-handedly rose above a rough childhood, including a stint in prison, and became one of the most successful and prosperous artists of the �s and �s. Brown earned the nickname, 揌ardest Working Man In Show Business,� as much by pouring his heart into every performance as by controlling all of the behind-the-scenes operations involving his business. At first, the thought was to cancel the concert, but many of the city fathers felt that this would only ignite an already tense situation. Finally, Brown agreed to do the performance. It was an excellent performance and gave the enthusiastic audience an opportunity to work off some steam and tension. Near the end of the performance, some of the excited crowd rushed the stage and were initially restrained politely by security, but as things progressed, one white security officer threw a black audience member back into the crowd, which nearly incited a riot. Brown coolly stopped the show, and gently admonished the audience, settling them down and also letting the security forces know that he had the situation under control, an amazing feat given the events of the past couple of days. The decision was made at the time to televise the concert as well, so the event not only reached the 15,000 or so in attendance, but also millions in the city who were unable to attend but could watch it on TV. The concert went over so well that it was immediately repeated on all the Boston TV stations and the radio. Shout! 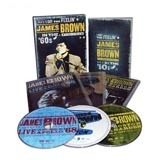 Factory has released this concert in its entirety, along with additional performances from the same period (Brown appeared at the Apollo the week before King抯 death), plus other features in the wonderful DVD compilation, I Got The Feelin� � James Brown in the 60抯. The set consists of three DVDs, the Boston Garden concert, an appearance from late March at the Apollo, and the recent VH-1 documentary called The Night James Brown Saved Boston. The documentary is a compelling mix of vintage footage and recent interviews with some of the principles, including band members, attendees, personal manager Charles Bobbit, who worked with Brown for 40 years, former mayor Kevin White and others like Rev. Al Sharpton, Dr. Cornel West, and music historian Rickey Vincent. To a man, they all agree that it was not only a phenomenal musical performance, but also an extraordinary example of an artist using his gifts to make the best of a difficult situation. The performance at the Boston Garden ranks as one of Brown抯 best. Filmed in black and white, there are a few video gaps at the beginning, but not enough that you don抰 catch the feel of the performance. Wisely, Brown didn抰 vary a bit from his usual act, carrying on his usual banter with his band and the audience as if nothing was out of the ordinary. The band, which featured Brown stalwarts like Maceo Parker, Jimmy Nolen, Alfred 揚ee Wee� Ellis, St. Clair Pinckney, Fred Wesley, and Clyde Stubblefield, was, as always, incredible. The performance at the Apollo was filmed in color. Interspersed with the performances are scenes of Brown walking through dilapidated areas of Harlem, During these scenes, a weary Brown (he was exhausted from nonstop touring and distraught over the recent death of blues singer and Brown mentor Little Willie John a few months earlier) states his mission: 揗y fight now is for the Black America�..to become American.� The set list is almost identical to the Boston Garden抯, but the performances are just as incendiary. Fans of James Brown will definitely want to add this set to their collection, but it deserves a spot in any real music fan抯 library.